A hearty sandwich can be a meal in itself. 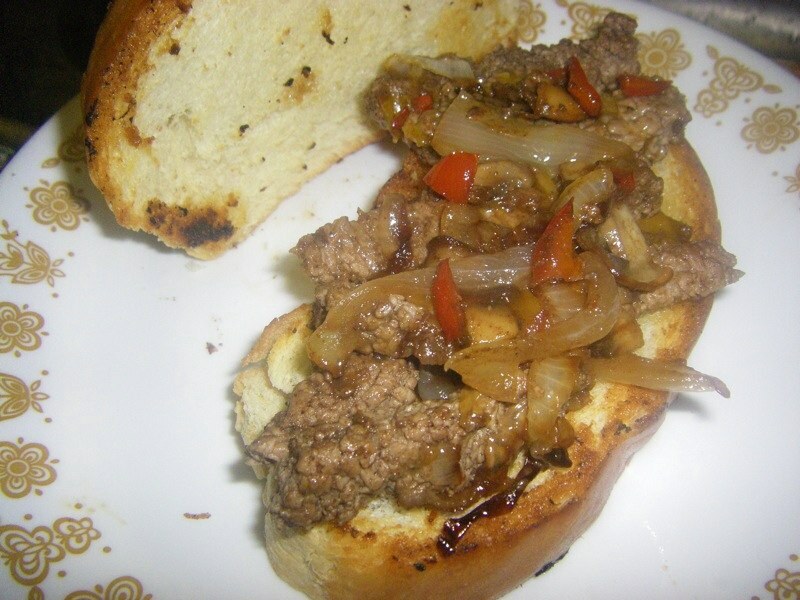 This one is similar to a Philly cheese steak sandwich, without the cheese. Yes, it tastes so good, you don’t even need cheese. The only trick to this sandwich is taking a few simple steps to make the meat as tender as possible. 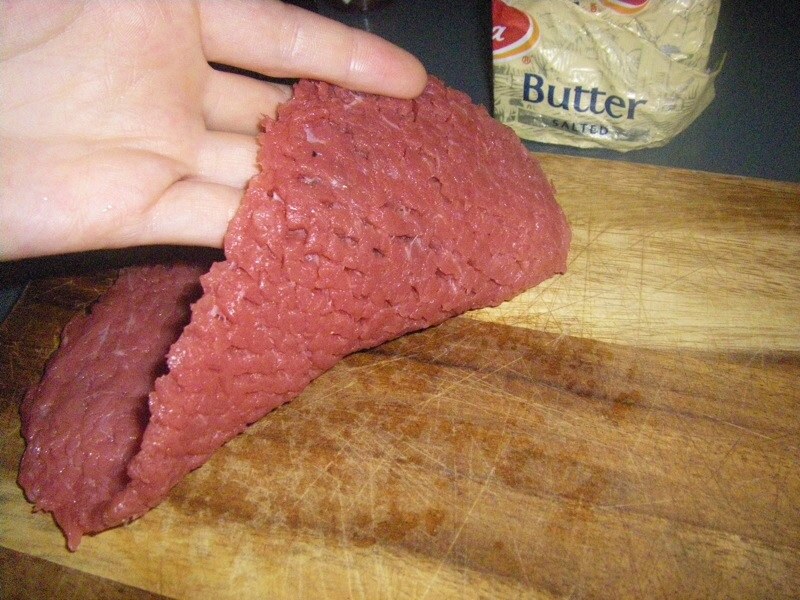 This involves cutting against the grain of the meat and cooking it with vinegar, a natural tenderizer. 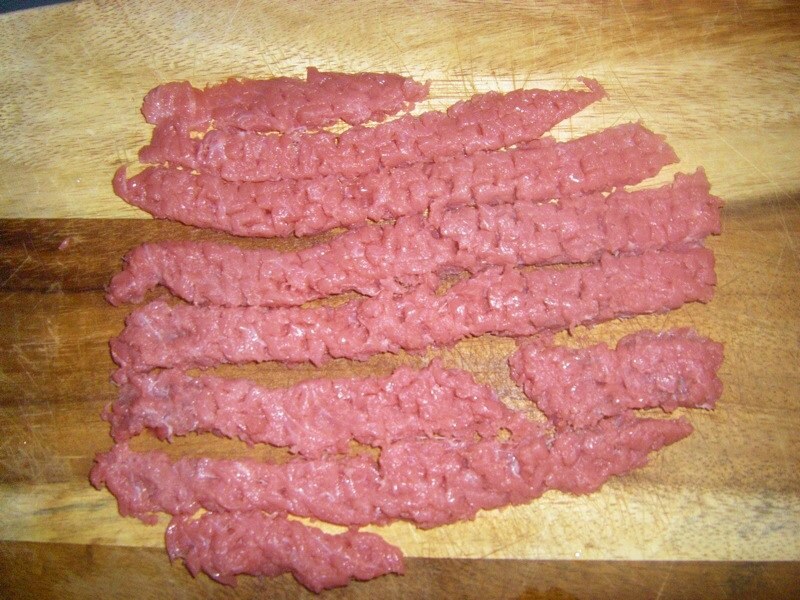 Fast-fry minute beef: sometimes called fast-fry sandwich beef, just make sure it looks like it has been hammered with a mallet and about to fall apart. Balsamic vinegar (or red wine vinegar): one or two tablespoons. Tabasco sauce: few drops to one teaspoon, depending on how much bite you like! Good quality bread, sliced thickly. 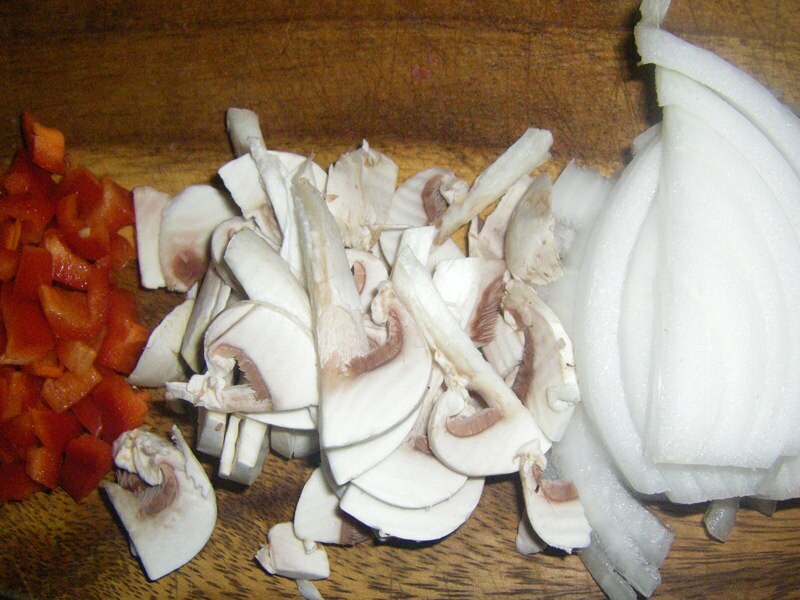 Optional: onions, red pepper, mushrooms, pepper (sorry the vegetables didn’t seem to make it into the photo). 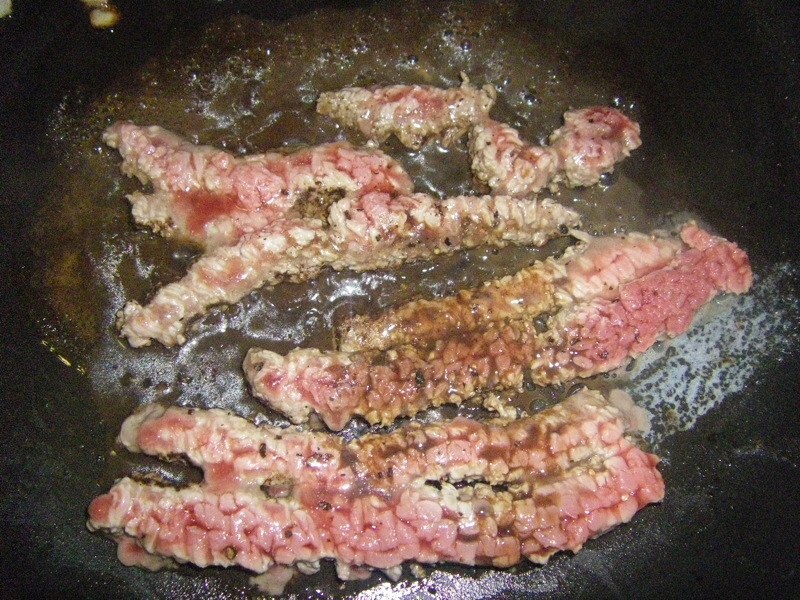 Find the “grain” of the meat. One side will show this directionality better than the other. In this case, on the underside of my meat, you can see the grain goes up and down, so I am going to slice the meat across to cut against the grain. Slicing across the grain will ensure the meat ends up more tender, easier to chew and also digest. 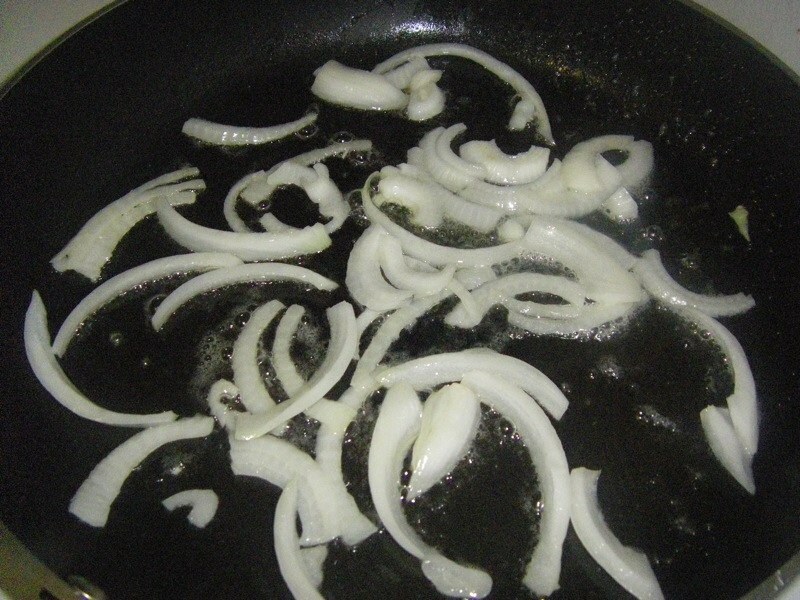 Throw your onions into a frying pan on medium heat with some butter. Always start with the onions because they take the longest to soften. 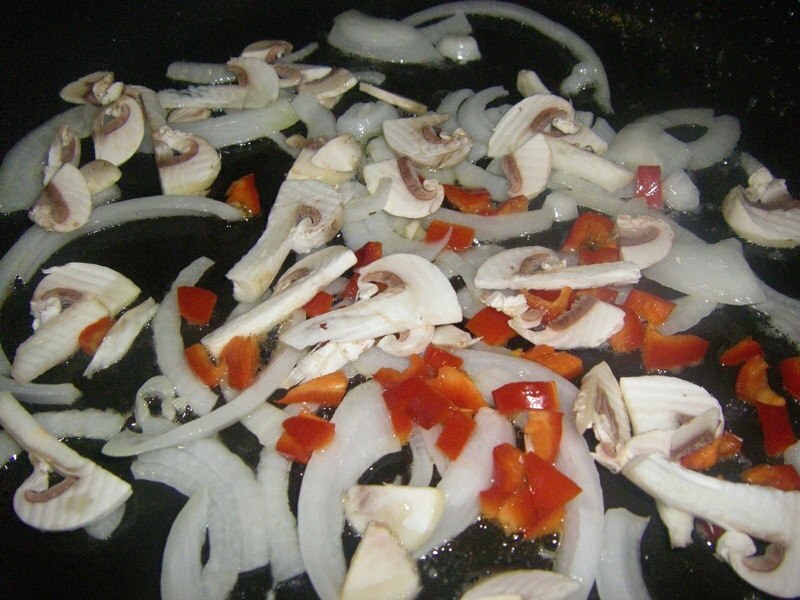 When the onions look sort of clear, they are soft enough and you can throw in the mushrooms and red peppers. When the vegetables look soft and cooked (this should just take about two minutes) remove them from the pan and toss the beef in. 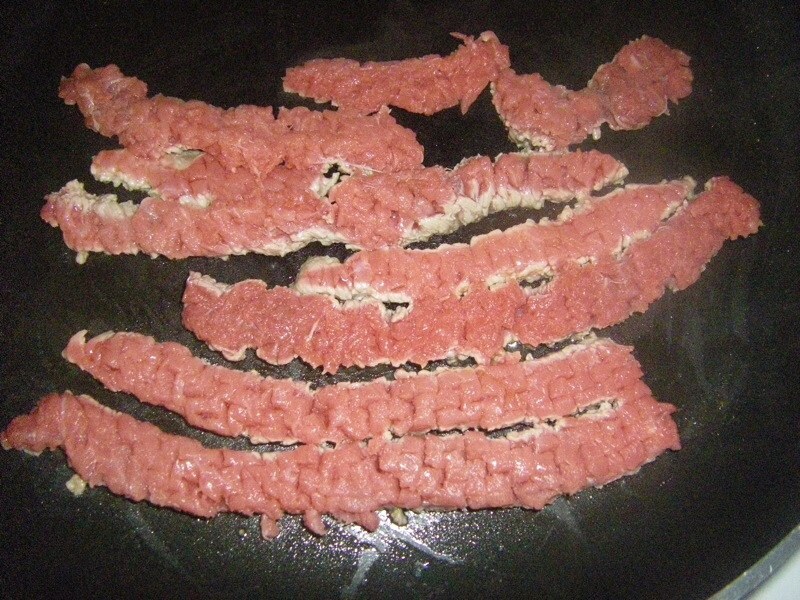 The beef will start cooking immediately! 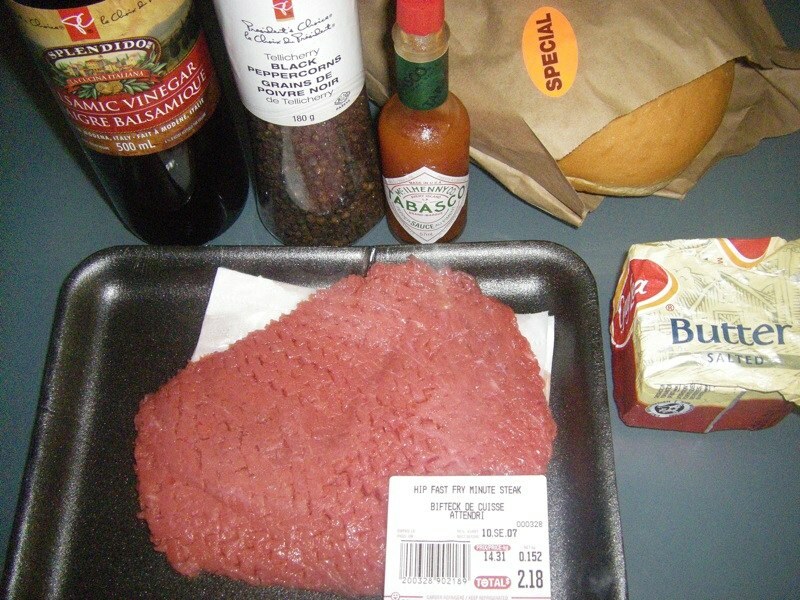 Since the meat cooks in just a few short minutes, quickly add the balsamic vinegar, tabasco sauce and pepper. The vinegar will work to further tenderize the meat. 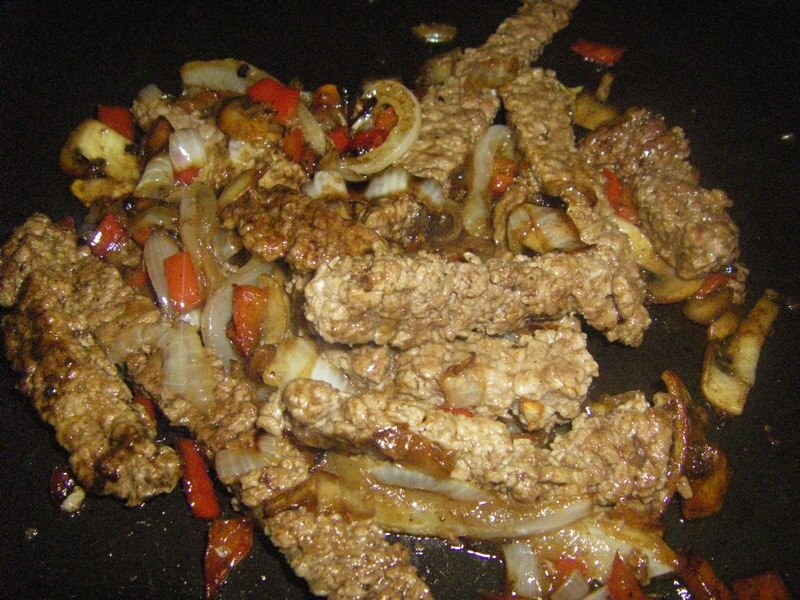 When the beef is browned, add the vegetables back into the pan to allow them to soak up some of the delicious juices. 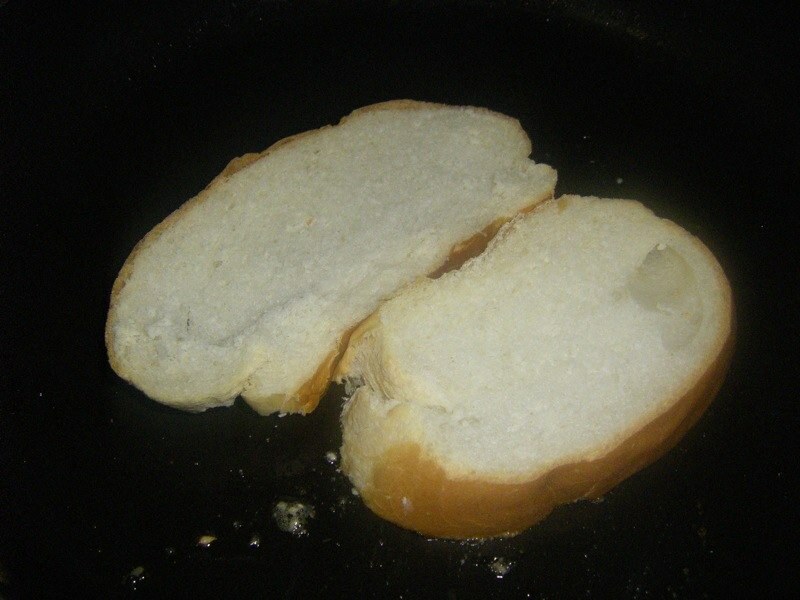 Remove everything from the frying pan and now add your thick bread slices. No need to butter them! 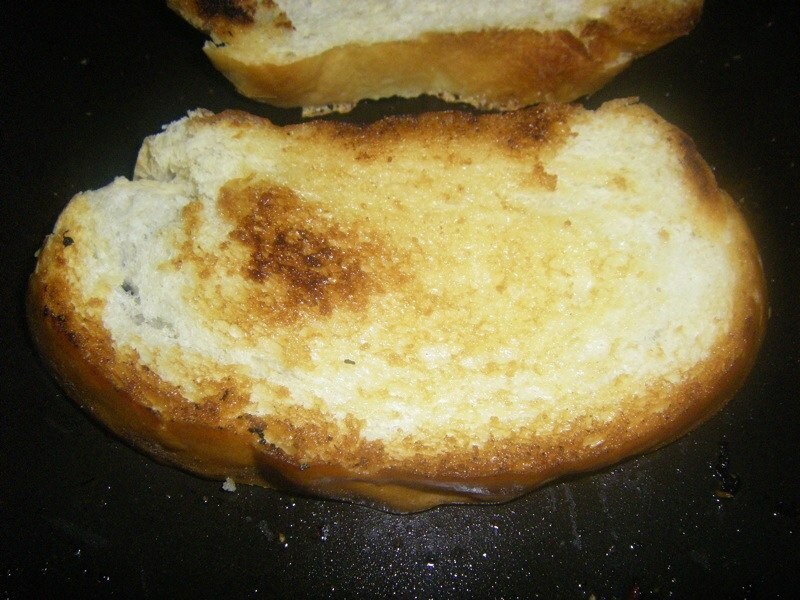 They should toast up nicely and soak up the last bits of flavour left in the pan. Place the beef and vegetables on the toast. Sit back, relax and fill up! 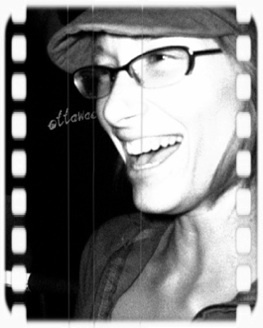 I guarantee you will continue to get requests for this one! Jump up. That looks gorgeous!!! I am trying this soon!